Barrett-Jackson’s Scottsdale 2017 classic car auction will include rare Mopars such as 1970s Plymouth Hemi Cudas and Superbirds. 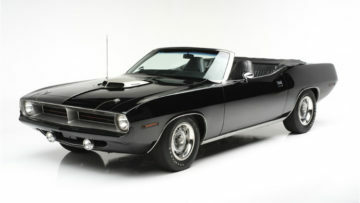 The 1970 Plymouth HEMI ’Cuda Convertible is one of only 14 made. A well-documented 1970 Plymouth Superbird has covered less than 15,000 miles from new. The 1970 Dodge Challenger T/A features its original 340ci Six Pack V8 engine with 4-speed factory transmission. Barrett-Jackson, The World’s Greatest Collector Car Auctions®, returns to Scottsdale for its 46th annual Arizona collectors car sale from January 14-22, 2017. This year, the auction will be held at the WestWorld of Scottsdale in Arizona. In 2016, Barrett-Jackson grossed $105 million and offered 1,469 cars for sale. Rare Mopars will be on offer at Barrett-Jackson’s Scottsdale 2017 collectors car auction. 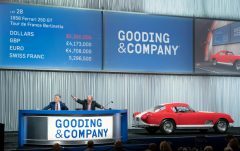 These American muscle cars are rarely seen at the sales of Gooding & Co, RM Sotheby’s or Bonhams but Mecum also had a number on offer earlier in January 2017 at Kissimmee in Florida. The 1970 Plymouth HEMI ’Cuda Convertibles on offer at Barrett-Jackson Scottsdale 2017 is a rare collectible as only 14 were built. This muscle car also has a significant race history and set national records. This 1970 Plymouth HEMI ’Cuda Convertible (Lot #1392) is enhanced by its color combination of triple black and a rich racing pedigree, including national records for ET and mph in NHRA and IHRA, as well as the SS Eliminator title at the 1973 U.S. Nationals in Indy. It was owned by Hall of Famer Steve Bagwell and driven by Hall of Famer Terry Earwood. Lot #1320, a 1970 Plymouth Superbird, is a rare original that is a well-documented survivor vehicle and only has 14,800 original miles since new. Only built for one model year, this Superbird features the rare factory Y39 Special Order code designation and is one of the best examples of Plymouth’s remarkable street packages. 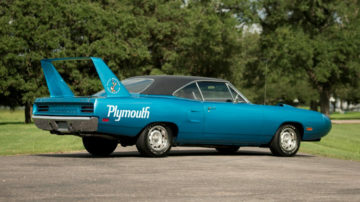 This multiple show award-winning Superbird includes a complete owner history and original artifacts and documents. The 1970 Dodge Challenger T/A (Lot #1031) is a great example of a factory T/A with its original 340ci Six Pack V8 engine with factory 4-speed manual transmission. 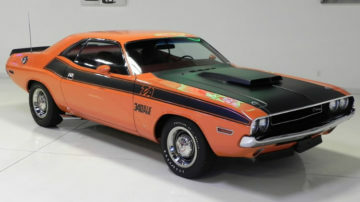 Painted in Go Mango orange with black graphics, this rust-free Challenger was restored in 2008 and is listed in the Challenger T/A Registry and comes with extensive receipts, information and a complete restoration photo album. Other significant Mopars crossing the 2017 Scottsdale block includes a 1971 Plymouth ’Cuda (Lot #1071). Equipped with a V-code 440ci 6-barrel motor and 4-speed manual transmission, this ’Cuda is painted in Sassy Grass Green and is one of only 108 4-speed V-code ’Cudas built. Also crossing the block is a 1970 Plymouth ’Cuda AAR (Lot #1030), which still carries its factory-original 340ci Six Pack engine and D32 TorqueFlite transmission. It underwent a frame-off, concours-level restoration and is fully documented by Galen Govier.